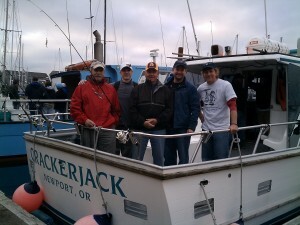 Have a private charter fishing trip with the crew from Yaquina Bay Charters! Yaquina Bay Charters would like to invite you on an exclusive private charter! Plan your own type of fishing trip. Add crabbing if you wish and let us know the number of guests and you’re in for a memorable event! Private charter fishing is a perfect solution for large families, social groups or company outings. Let us know what you need to make your perfect vacation complete! Enjoy Tuna, Halibut, Salmon, local rockfishing or whale watching. Call ahead and let us do the planning. Seasonal fishing times do apply so get your charter reserved quickly. Let us do the work, you sit back and enjoy the ride. Please call for reservations and availability.